Symphony No. 9…Throughout music history, this title has occupied a mythic place in the collective imagination. The symphonic output of Beethoven, Schubert, Bruckner, Dvořák, and Mahler culminated with a ninth symphony. In one way or another, all of these works, written in the final years of their composers’ lives, move beyond the ordinary into strange, mysterious and transcendent territory. They stand as awe-inspiring musical revelations. To be fair, some of these composers wrote slightly more or less than nine symphonies. Anton Bruckner died without completing the final movement of his Ninth Symphony. Yet, as the final, soft chords of its “Farewell to Life” Adagio fade away, the symphony feels strangely complete. 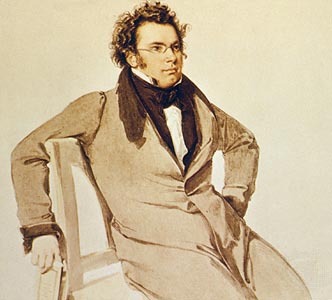 When Franz Schubert died at the tragically young age of 31, he left behind a piano score for what would have become his Tenth Symphony. Sketched during the final weeks of Schubert’s life, the score wasn’t authenticated until the 1970s. Brian Newbould attempted to complete and orchestrate the symphony (listen here). Gustav Mahler completed the first, haunting Adagio movement of a Tenth Symphony before he died in 1911. It seems that the Ninth is a limit. He who wants to go beyond it must pass away. It seems as if something might be imparted to us in the Tenth which we ought not yet to know, for which we are not ready. Those who have written a Ninth stood too close to the hereafter. Which brings us back to Schubert’s Ninth…Sketched during the summer of 1825, a year after the completion of Beethoven’s epic Ninth Symphony, the “Great” C major Symphony was a radical departure from the small-scale elegant charm of Schubert’s earlier classical symphonies. The nickname, “The Great” was intended to differentiate the work from the “Little” Symphony No. 6 in C major. Schubert’s Ninth rose to the new, heroic scale of Beethoven’s symphonies. But while Beethoven’s music developed in bursts of short motivic cells, Schubert, the composer of over 600 songs, tended to perceive music melodically. Perhaps due to its length and the technical demands it placed on musicians, the Ninth Symphony was neglected in the immediate years after Schubert’s death. It wasn’t until 1838, ten years after the composer’s death, that Robert Schumann discovered the manuscript and brought it to Felix Mendelssohn, who conducted a performance at the Gewandhaus in Leipzig on March 21, 1839. Schubert’s Ninth Symphony would serve as a profound inspiration for Schumann’s own symphonic aspirations. The first movement opens with an expansive introduction which contains a miniature exposition, development and recapitulation, suggesting Sonata form within the movement’s larger Sonata form structure. The opening theme, which returns triumphantly in the culminating bars of the coda, first emerges as a solitary line played by the horns. As the music develops, allow your ear to drift down to the pizzicato pulse in the low strings. Feel the motion. Stay tuned to the increasing complexity of this sparkling underlying rhythmic motor and the occasional “three against two” rhythms. Schubert’s Ninth Symphony is full of musical conversations between groups, or “choirs” of instruments. Listen to the way the theme is passed around the orchestra between 0:56 and 3:32 in the clip below. Consider the personas suggested by each group of instruments. The trombones, long associated with the supernatural, rise to a new level of prominence in this symphony. Up until this point, trombones had usually remained in the background, outlining chords. In the Ninth Symphony, for the first time, the three trombones function melodically, adding a powerful and heroic new voice to the mix (6:24, 8:10 and 11:45 in the recapitulation). Key relationships are also important in this music. In Schubert’s case these often involve modulations built on thirds. Listen for those incredible moments when we’re suddenly whisked off to a surprising new key (the exposition’s second theme at the 5:14 mark, the beginning of the development section at 5:15 and the passage between 10:38 and 10:47). The second movement begins with a jaunty melody which alternates between A minor and C major. But just beneath the surface, an interesting drama is about to unfold. The music suggests a subtle sense of impending conflict and danger. At 16:19 we hit a “brick wall” and the music falls back into line. This musical stop sign occurs throughout the movement and each time the music retreats…until it doesn’t. The intense conflict comes to a head at the movement’s climax (23:48), where we’re suddenly thrust over the edge into new, ferocious territory. At this moment, we hear sounds which would have been unimaginable in an elegant classical symphony. When it’s over there’s a terrifying moment of silence…and then the music resumes. As you listen to the conclusion of the second movement, consider whether this ominous sense of conflict has been resolved, or if it has simply subsided to return another day. The final movement opens with flourishes which may bring to mind the trumpet calls of Rossini’s William Tell Overture. Keep listening and you may hear echoes of the Ode to Joy from the last movement of Beethoven’s Ninth Symphony…a fitting spiritual connection for two earth shatteringly powerful ninth symphonies. Here are a few prominent recordings of Schubert’s Ninth Symphony. Please share your thoughts about the music and your own favorite recordings in the comment thread below. Herbert Blomstedt and the Staatskapelle Dresden -the recording above, from 1982. George Szell and the Cleveland Orchestra -a classic and passionately performed rendition. Listen here. Christoph von Dohnanyi and the Cleveland Orchestra -a 1985 on the Telarc label. Frans Brüggen and the Orchestra Of The 18th Century -a period instrument performance. Listen here. Nikolaus Harnoncourt and the Vienna Philharmonic -an interesting and slightly idiosyncratic performance.